When the wave of Information Technology (IT) swept off this quiet suburb of Tamil Nadu, the residents did not know what really was coming. Gradually, Kelambakkam gained recognition among the residents and also from people coming from outside the city for work. The influx of IT professionals changed the face of the city providing it a specialized touch with an increase in demand for local services and of course, houses. A 3 bhk flat in Kelambakkam remains a favorite among those buying or renting houses here. Situated on the Old Mamallapuram Road, a well-known IT corridor popularly called the Rajiv Gandhi Salai, Kelambakkam was destined to develop. The advent of IT companies and the setting up of huge campuses by them on the Mamallapuram Road was the key to its infrastructural and commercial success. The discreet city gradually developed into a bustling suburb providing residential options for the employees of the big MNCs. The local Government realized the urgency and the city rapidly developed into a real estate hub. Funds to improve the overall infrastructure were poured in and this led to the development of roads, public facilities and new generation housing societies in this small town of Tamil Nadu. With IT giants like Infosys, Wipro, Cognizant, Polaris, Tata Consultancy Services and many more MNCs having their offices in Kelambakkam; the global professional working with these companies required decent and furnished accommodations which were earlier not present there. Local Government realized the urgency and the need to encourage private builders to build colonies and flats in the area, gave them a leverage to invest in the area. Today, top private builders have their projects in the area and a 3 bhk flat in Kelambakkam is a hot pursuit, because of its sheer spaciousness and price reasonability. As the development struck, new areas were developed which were cosmopolitan and mired by new age constructions. New localities like Jothy Nagar, Jothy Nagar Welfare Land, Rajeswari nagar, Kanaga Parameshwaran Nagar, Balaji Nagar, Mogambigai Nagar, Ganapathi nagar, Lakshmi Avenue, Krishna nagar, Sri Sai Vighar and Sri Nagar were formed. The government expedited the infrastructural development to retain investors putting money in the State. 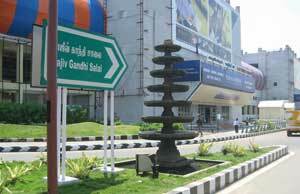 Lying on the Rajiv Gandhi IT Corridor is and will always be a plus point for the property in Kelambakkam. Being so close to this professional hub has acted as a galvanizer for the city. A 3 bhk flat in Kelambakkam currently ranges in Rs 2500 per square feet to Rs 5000 per square feet (January to April 2013 figures).